The Toyota 4Runner is a fully capable mid-size sport utility vehicle that got it’s start in the United States in 1994. The 4Runner is a cross between a compact and mid-size SUV, making it the perfect vehicle for both adventurers and families alike. The seven-passenger SUV makes it a worthy competitor in its segment, and a popular choice amongst adventure-seekers and families alike. Currently in its fifth generation, the 2015 Toyota 4Runner offers exciting new features and developments that were not previously part of the vehicle’s lineup. The 4Runner is offered in six different styles of trim levels, but the SR5 is the perfect solution for active families on the go. The 2015 4Runner TRD Pro is brand new to the vehicle’s lineup, and represents the most capable off-roading version of the SUV yet. 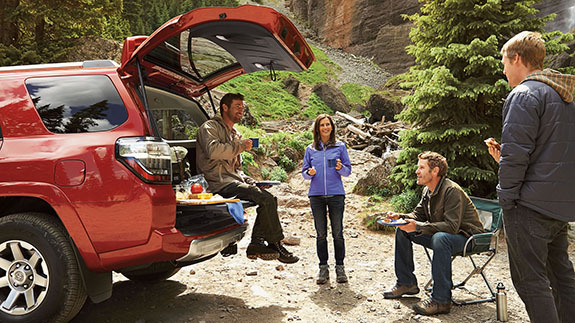 And the interior of the 4Runner is built to accommodate plenty of gear, with convenient features to aide in any adventure that it is a part of. The 2015 Toyota 4Runner is many great trim level options, but the base SR5 offers the perfect solution for adventure-seeking families on the go. Starting at just $33,210, the SR5 comes equipped with a long list of standard features, and can even tow up to 4,700 pounds. Fully capable, loaded with standard features, and a low sticker price. Check out why the 2015 4Runner SR5 is the perfect family vehicle. Power and Performance: Driver’s can chose either a 4x2 capable SR5 4Runner, or the off-road capable 4x4. Both comes with a standard 4.0-liter V6 engine featuring a 5-speed automatic transmission. With a towing capacity of 4,700 pounds, the SR5 will help your family haul whatever you need to make your weekend at the lake perfect. Efficiency: This mid-size SUV features an impressive fuel economy of 22 miles per gallon on the highway, and 17 mpg in the city. With all of these great standard features, the 2015 Toyota 4Runner SR5 is the perfect solution for the family who seeks adventure without making sacrifices, all at one low cost. 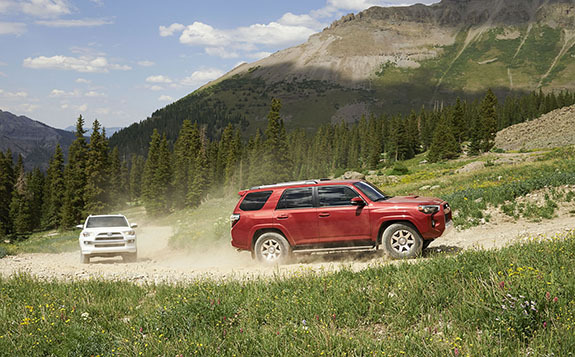 Driver’s who seek the ultimate adventure should chose the all-new 2015 4Runner TRD Pro. This off-road machine can take you wherever your wildest adventures await. The brand new suspension on the TRD Pro features oversized TRD Bilstein high-performance shocks with rear remote reservoirs, and TRD tuned springs. The toughest terrain will be conquered with ease inside of the 4Runner body-on-frame TRD Pro model. 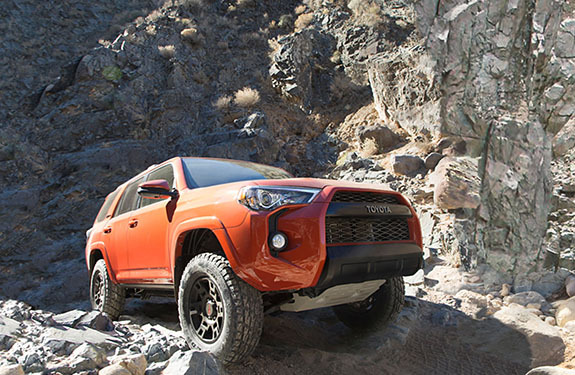 The 2015 4Runner TRD Pro packs a powerful punch with its 4.0-liter 270-horsepower V6 engine. It includes multi-terrain select, crawl control, and an electronic locking rear differential for added off-road performance. The TRD tuned suspension can conquer any trail, even the most extreme surfaces. The 2015 Toyota 4Runner is a utility vehicle like no other. Ready to hit the trails, or hit the pavement, this fully-capable SUV is also packed with great features that make it easy to travel with anywhere. Three rows of seating, a fold-flat second row of seating, power rear glass, a sliding rear cargo desk, smart key system with push button start, and the 120-volt AC power outlet are just a few of the conveniences added to the 2015 4Runner. The class-exclusive power rear glass is as unique as it is practical. With the push of a button, the rear glass lowers, making it easier to transfer gear in and out of the cargo area. The open air option also makes a great cooling system on hot days. From camping in the middle of nowhere, to driving the kids to school each day, the 4Runner delivers capability and convenience.